2015 Treana Red, Treana Winery, Paso Robles, California, USA. 2013 Cabernet Sauvignon Reserve, Edwards & Chaffey, Napa Valley, California, USA. 2015 Cambridge Meritage, Napa Valley, California, USA. 2016 Domaine d’Andezon Cotes due Rhone, Red blend. Rhone, France. 2015 Mestizaje, Mustiguillo Vineyards & Winery, Red blend. Spain. 2011 Jip Jip Rocks Shiraz Cabernet, Padthaway, Australia. 2015 Antal’s Selection Zinfandel, Buena Vista Winery, Russian River Valley, Sonoma, California, USA. 2012 Acha Red, Mark Herold, Napa Valley, California, USA. 2002 Syrah, Miller Wine Cellars, Napa, California, USA. 2014 Claret, White Rock Vineyards, Napa Valley, California, USA. 2016 Gundlach Bundschu Mountain Cuvee, Sonoma, California, USA. 2015 Cabernet Sauvignon Winemaker’s Reserve, Robert Storey Cellars, Napa Valley, California, USA. 2012 Napa Reserve, White Oak Vineyards & Winery, Napa Valley, California, USA. 2014 Amarone la Giaretta della Valpolicella, Italy. 2015 Shiraz, Layer Cake, South Australia. This full-bodied road bottle hails from Australia’s Barossa Valley. The 2014 Cabernet Sauvignon from Barossa Valley has some tannin bite to it, but some enjoyable fruit flavors too. As it’s a bottle keeping me company on a travel week in NJ, this post is more “snapshot in time” than it is a true review; hoping you’ll look past it on this occasion and continue exploring some of the truer gems that Notes can offer. 2014 Cabernet Sauvignon, Barossa Valley Estate, Barossa Valley, Australia. Some whites (this one is a 100% Chardonnay) have more of that oak smell or flowers to them, while others–like this JCB–carry more fruit notes. This sparkling, produced in Burgundy’s Cote d’Or region, was served to us after signing in at the registration desk. Nice apply start to the tasting. My last white tasting this night, a blend of 95% Pinot Grigio and 5% Chardonnay, jumped out when described by the hostess. She was tending to an array of whites, and her notes zeroed me in on this Italian wine…I know someone (you know who you are!) who would have really liked this white. The Grigio lead the way in terms of taste, and I am not sure I could have determined the Chardonnay in the mix if I had not been told of its inclusion. Jumped softly into the pool of reds with this raspberry-scented Pinot, produced by Joe Dobbs in the Willamette Valley region of Oregon. I eschewed Mark West and Meiomi offerings in order to try something new in the Joe. Little bit of cherry in this gentle Pinot, which was quite delicious and a welcome shift from the whites. I’ve sampled the Strong previously, and both the vineyard and any Russian River Valley Pinot Noir make a compelling argument to repeat a tasting (despite what I literally JUST said about the West and Meiomi). I was not disappointed at all. It’s beautiful cherry, soft, and aromatic in the glass…even the vanilla notes I enjoyed in the Rodney tasting. One of the evening’s highlights to be sure. Table four consisted of California reds, and those who read Notes with any frequency can imagine we drifted quickly to this area and stayed here the longest. This Sonoma County Cab was superb; expresso and dark cherry and mocha all wrapped into one dark, delicious beauty. Even had a little smokey hint to it…in many ways this red had all the nuances that I like about California Cabernet. The McDonnell family in Napa Valley (the Rutherford AVA as I read later) is responsible for this peppery and blackberry-tasting Cab. Some of this wine reminded me of good Syrah–perhaps its spice notes and the generous mouthfeel? In another year or two this one is going to be spectacular, and I was sort of picturing myself with a whole glass of this bad boy instead of just the sampler. This is another Bordeaux-style blend, this one 84% Cabernet Sauvignon, 9% Merlot, 5% Petit Verdot, and 2% Other. It was okay but suffered a disadvantage by following the fruit-forward Michelle and Round Pond gems. This Napa Valley offering had a peppery finish but my vocabulary (or perhaps my inexact notes) doesn’t stretch far enough with the Hall. Really enjoyed the wine, but I’d prefer another glass of many others if pressed. Much better change of pace here. This too is a Napa Valley Cab, made of grapes sourced from Atlas Peak (from where I’ve had some enjoyable wine to be sure). It had a fantastic scent in the glass, red and black fruits that I’d say were black cherry and blackberry. You get a sense of the pepper here too, one of those soft layers that sneaks into a good wine, subtly reminding you of a presence of something greater. Nice flavor in the Yardstick–which is a GREAT bit of branding btw. Um, yes, not a California red but I understand its inclusion in this table. It’s got that Bordeaux vibe to it for sure, with raspberry notes and dark fruits mixing together. I was kind of interested in this one (not sure I’ve had a Norman ever before) but it was only okay. I know. You’re saying three more still? Steve and I said much the same this Saturday night as we sampled our way from Europe to North America, South America, and Australia all in one sitting. From the name I bet you’re thinking this one is international in origin, but it’s actually a Sonoma County blend of 37% Cabernet Sauvignon, 31% Merlot, 12% Cabernet Franc, and 10% Zinfandel. If you think that sounds like inelegant science you’re mistaken. This red blend was luscious in dark fruits and had an easy finish. A surprising pleasure and I’d like another glass on a night when my palate was not being so bombarded by so many flavors just so I could share more details with you on the Gundlach-Bundschu. This one too is a combination (Cabernet Sauvignon, Merlot, Cabernet Franc, Petit Verdot, and Malbec) red, Bordeaux in style. We got talking to some friendly patrons while sampling this round, and I’m afraid I have nothing of consequence to relay about the Trefethen. Wine & Spirits describes its “…plummy, jammy nose, its cherry-berry flavor profile, and its smooth, chocolate-covered finish” but I cannot recall from firsthand experience. Not sure if I should include this one or not. I am unsure of the winemaker or region for this one, or candidly the label or grape. Is very likely a red blend in the Bordeaux style, simply by its grouping at this particular table. A Google search yields too many “hills” to narrow the field, so this is definitely a clunky last entry. I wrote, “Easy finish. Dark cherry and raspberry with small tannins” but cannot be any more helpful than that. Disappointing and may even edit this one out in the future…sort of weighing the journalistic integrity either way. I’m a little regretful that I didn’t take better stock of the vintage in the above. Most were assuredly ’13s and ’14s but I am pretty sure there were a few ’12s in the mix too. Sorry about that, fans. 2015 Willunga Chardonnay, South Eastern Australia. 2012 Maglieri Shiraz, Padthaway, Australia. 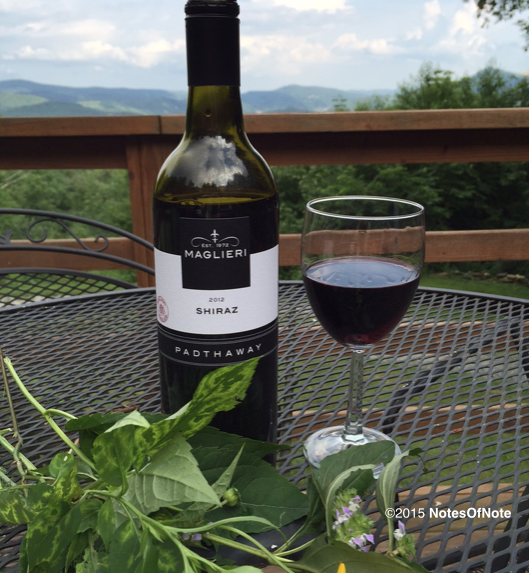 A valuable Australian Shiraz, one that climbed with us up the Blue Ridge Mountains to our little cabin hideaway on the outskirts of Newland. The Maglieri was an online purchase–it sounded delicious, was the right bit of affordability, and struck a chord with my recent penchant for Syrah. …but this savory red is far more than just mountain vistas. It’s nearly purple in color and has complex, rich aromas to it. The Maglieri smells of fruit, of spice, and of pepper. There are other scents too–both dark berry and smoky things. You sample this 2012 and then you re-taste the tip of your tongue, puzzling through some hidden flavors that emerge over time. We had the 2012 Maglieri Shiraz along with grilled steaks (and yes this expensive-tasting wine opens up with pepper) seasoned just with salt and pepper. Wax beans (thanks love!) and baked potato too, lightly sauced up with nonfat yogurt. All in all, a thoroughly enjoyable summer supper in the mountains of North Carolina. “The wine is savory with loads of ripe fruit including blackberries, black cherries, dark raspberries, toasty vanilla oak, mocha, cassis and a cinnamon spice box,” is how one pro summarized the Maglieri. Now, I have no idea what a “dark” raspberry is, but I think it’s the cassis that I was fighting to identify above. Seems like every time I’m wrestling over a spice nuance it comes down to cassis–here too I think. No matter how you describe it, the 2012 Maglieri is a special wine to be sure.